Dallas 500 is a special edition that celebrates the most influential business leaders in North Texas. Unprecedented in scope, it’s the result of a year-long research initiative by the editors of D CEO, which has been named the country’s best regional business magazine for the last four years. Dallas 500 provides a personal, engaging look at the leaders who make Dallas-Fort Worth’s economy tick. Nomination deadline is May 15, 2019. Get the 2019 edition today for a price of $34.95. The editors of D CEO present the most powerful top executives in more than 60 business categories. The Dallas 500 is the region’s and highly selective biographical database of the people who really run Dallas-Fort Worth business, based on extensive contacts in North Texas business circles, hundreds of interviews, and months of research. What is The Dallas 500? 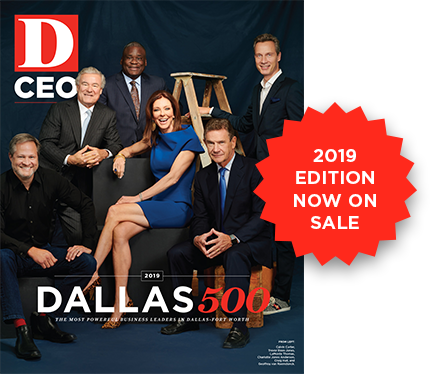 The Dallas 500 is a special annual publication produced by the editors of D CEO (the award-winning business title of D Magazine Partners). It features personal, insightful profiles of the 500 most influential leaders in North Texas. The luxury publication is printed on heavy stock and designed to be both a reference tool and a keepsake. The Dallas 500 features the region’s most powerful leaders in 60 categories. D CEO editors compile the list based on extensive contacts in local business circles, hundreds of interviews, and months of research. When does the publication come out? The Dallas 500 is published and distributed in November. You can purchase the most recent edition of Dallas 500 in the section above.